Finished the Gardner Sock! Will be giving it to B tomorrow at the StarBase Indy event (whoo hoo!) I will also be checking out the Geek Knitting workshop at 10 pm – can’t wait! Below are pics from the Gardner sock – off the foot it looks odd, but it fits on the model nicely. Gardener Sock – Half Done! The Gardener Sock is half complete – that is, one sock done. The other sock is started, but this picture should let you see how it’s coming along. Sadly, the nifty spider up the back of the leg is hard to see. Note to self – have the talented photographer-daughter start taking project photos. I had a lot of trouble with the picot edging. Turns out, I was attempting to knit it upside down and backwards (don’t ask- when I figured out what I was doing wrong, I couldn’t figure out HOW I was doing it so very wrong!). I knit the sample (above) and it’s actually pretty easy, if done the right way. 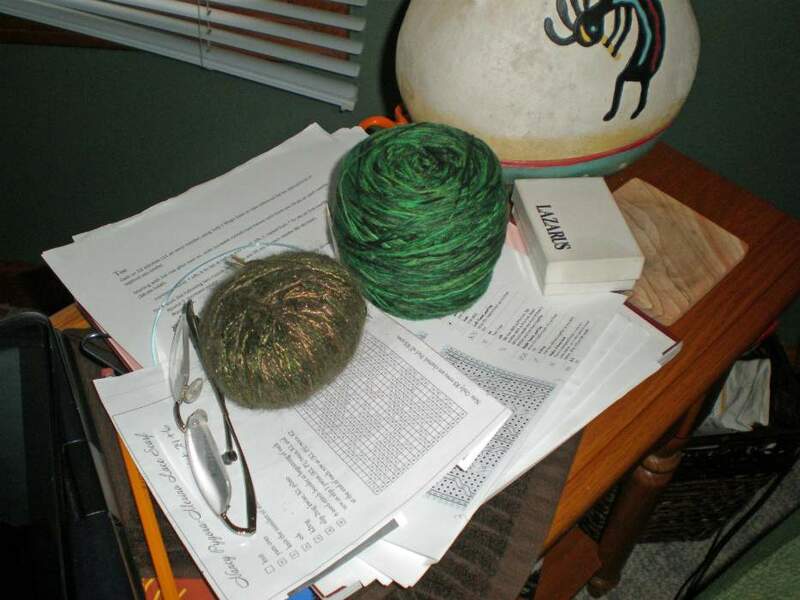 Posted on October 1, 2012 December 26, 2013 Categories KnittingTags Sock, WIP1 Comment on Gardener Sock – Half Done! Not one, but TWO projects completely unwound. Check out previous posts for the Garden Sock, and the Merino Lace Scarf. The Garden sock, I discovered, was too short for adult feet. Note to self – check the measurements and verify the gauge. 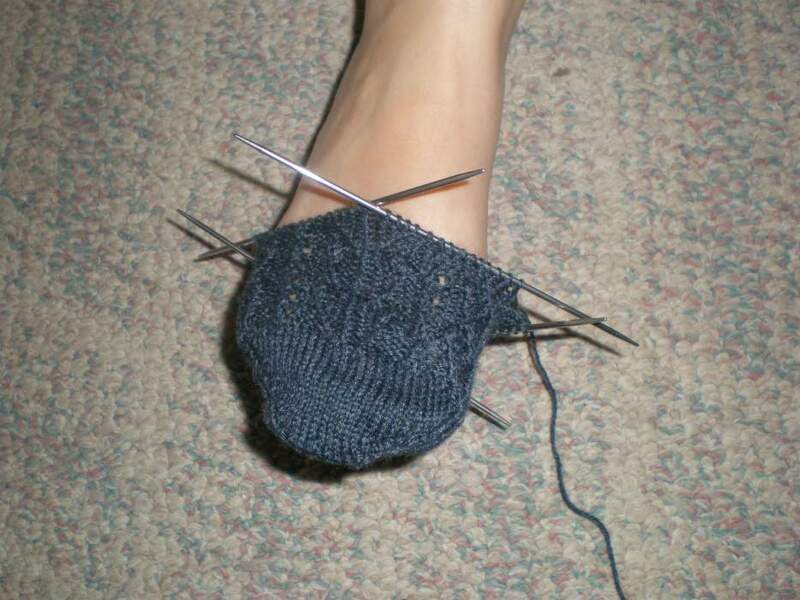 I did, but not correctly, and when I finished the heel, I realized it was much too short. After unwinding the sock, I decided to console myself with a little work on the scarf. I realized that I could no longer tolerate the boarder, which I knew I was wrongly knitting. So, it was unwound, too. The crappy day I had, yesterday, probably contributed to that last one. But I really did need to start over on The Gardener. Happy Thursday. So, my friend will be getting these socks out of the lovely yarn we found. After taking a look at the pattern, I realized I was a bit over my head, so I started practicing. Several of the techniques in The Gardener can be found in Cat Bordhi’s book, “New Pathways for Sock Knitters, Book One,” a copy of which I received one year for Christmas, but hadn’t really explored. It’s a great book – the author explains new techniques very well, and has improved upon several standard techniques in sock design and construction. Am I GLAD I did this! Turns out a little more challenging than I expected, and really required some mental and manual dexterity (finished socks, below). Now, on to the Gardner socks. Again, with the challenging pattern, I decided to use scrap yarn to start the sock to see how I got along with the pattern – a vine on the front with a big spider up the back of the sock. Also toe-up, riverbed construction. Here’s what I have so far, and I’ve discovered that the vine pattern isn’t as hard as I feared, so I’m about ready to jump to the fashion yarn. I’ll post the yarn information and in-process pictures later, so my Dear Reader can follow along.